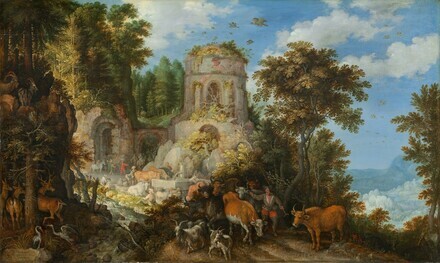 A spring-fed watering trough nestled among ancient ruins high in a mountainous pass has enticed a plethora of people and animals to its refreshing water. As cattle drink and sheep rest in the surrounding glade, the area buzzes with so much activity that it is easy to overlook the insignificant-looking group of travelers passing under an archway in the background. Small in scale and depicted in subdued colors, the figures seem the least important of all those present, yet they are none other than the Holy Family on the Flight into Egypt. The three shepherds near the watering trough have doffed their caps because the mysterious light shining down on them has made them realize that they are in the presence of the Christ Child. Savery painted this scene during an extremely productive and successful period following his move to Utrecht in 1619. The exotic character of his mountainous landscapes reflects his travels in the Alps and in Bohemia during his residence at the court of Rudolph II in Prague between 1604 and 1614, but his paintings are essentially creations of his imagination. During the 1620s Savery received major commissions from the city of Utrecht, and his paintings were collected in courts throughout Europe. Although his work at this time could no longer be called innovative, his superb skills were highly valued and enabled Savery to continue to paint in his mannerist style long after artistic trends in other centers had begun to focus on more naturalistic images of the Dutch countryside. (Anthony Speelman, London); Robert H. Smith, Washington, D.C., by 1988; (sale, Sotheby Parke Bernet, New York, 14 January 1988, no. 86, bought in); Mr. and Mrs. Robert H. Smith, Washington, D.C.; gift 1989 to NGA. In a letter of 7 September 1993 (in NGA curatorial files), Anthony Speelman wrote to Arthur K. Wheelock, Jr.: "The only provenance that I have on the Savery is that it was bought in c. 1890 in Berne by the previous owner's family..."
Art for the Nation: Gifts in Honor of the 50th Anniversary of the National Gallery of Art, National Gallery of Art, Washington, D.C., 1991, unnumbered catalogue, repro. A Collector's Cabinet, National Gallery of Art, Washington, D.C., 1998, no. 54. The support consists of two horizontally grained oak boards joined horizontally at center. The panel has a slight convex warp, and a long check runs horizontally from the upper left comer. A thin, granular white ground was brush-applied overall except along narrow bands at the vertical edges. A dark reddish brown imprimatura was applied under the foreground. Infrared reflectography reveals brush-applied underdrawing, with the composition outlined and shadows crosshatched. Paint was applied in thin, smooth layers modified by glazes and scumbles. Brushmarks are visible in the sky, and tiny flecks of impasto highlight the animals. Minimal amounts of inpainting, of two distinct applications, cover gray stains in the sky, minor losses at left, and losses along the edges, check, and panel join. No conservation work has been carried out since acquisition. Infrared reflectography was performed with a Hamamatsu c/1000–03 vidicon camera fitted with a lead sulphide tube and a Kodak Wratten 87A filter. Müllenmeister, Kurt J. Roelant Savery: Kortrijk 1576–1639 Utrecht, Hofmaler Kaiser Rudolf II, in Prag: die Gemälde mit kritischem Oeuvrekatalog. Freren, 1988: 272, no. 168a, 275, repro. Kopper, Philip. America's National Gallery of Art: A Gift to the Nation. New York, 1991: 324, color repro. National Gallery of Art. Art for the Nation: Gifts in Honor of the 50th Anniversary of the National Gallery of Art. Exh. cat. National Gallery of Art, Washington, 1991: 56-57, color repro. Wheelock, Arthur K., Jr. Dutch Paintings of the Seventeenth Century. The Collections of the National Gallery of Art Systematic Catalogue. Washington, 1995: 360-363, color repro. 361. Gifford, E. Melanie. "Jan van Goyen en de techniek van het naturalistische landschap." 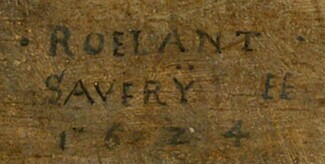 In Jan van Goyen. Edited by Christiaan Vogelaar. Exh. cat. Stedelijk Museum De Lakenhal, Leiden. Zwolle, 1996: 70-79. Wheelock, Arthur K., Jr. A Collector's Cabinet. Exh. cat. National Gallery of Art, Washington, 1998: 68, no. 54, repro.